Capture live phone interview answers and candidate insights for cooperative team decisions and a faster interview process. Relaxed-fit phone interviews with customers and clients. Customers only need to call a phone number. Ask impromptu questions or use a custom interview script. Capture customer answers in real-time. After the call, easily share audio highlights with team members for collaborative decision making, without misinterpretation & bias. Our initial conversations with job candidates are the most important step of the hiring process. However, phone interviews are still “off-line” and the live interview data and candidate insights are lost forever. 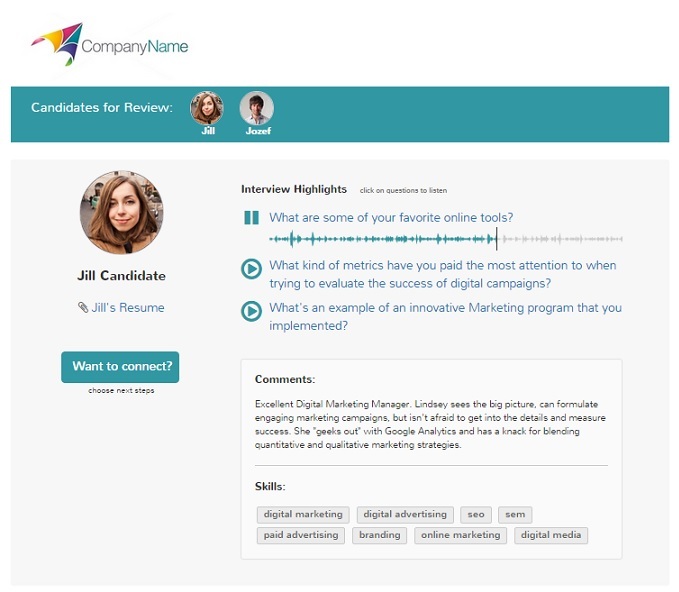 Share unbiased interview insights to improve communication and make better decisions, faster. Our real-time interview dashboard is synchronized with your phone or VoIP conversation. Leverage custom interview scripts to keep your customer interviews consistent and never forget a question. Capture audio answers, time stamp keywords and type notes throughout the call. We record the entire conversation in addition to providing a rich new data layer. After the interview, review or edit recorded answers, time stamps and interview notes. Easily share highlights, compare or aggregate interview insights for reporting and analysis. Go beyond quotes and include live audio excerpts in reports, papers and presentations. Easily share customer interview insights, audio excerpts and data from live customer phone interviews. Compare multiple customers, identify themes and trends for better reporting and analysis, without common misinterpretation & bias.